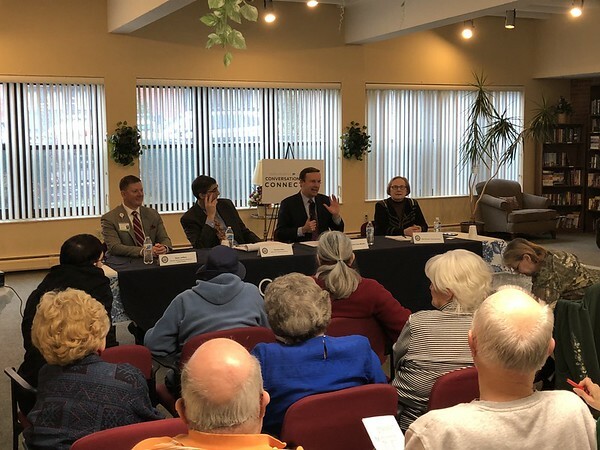 NEW BRITAIN – Flanked by two healthcare experts and a state senator, U.S. Sen. Chris Murphy, D-Conn., visited the city Monday morning to discuss rising prescription drug costs with senior citizens and caretakers. Murphy, joined by state Sen. Terry Gerratana, D-New Britain, State Healthcare Advocate Ted Doolittle and University of Connecticut professor Sean Jeffery, made the stop in New Britain to hear firsthand accounts of experience within the healthcare system and provide updates as to what is being done at the legislature. “These drug companies, and all of the for-profit entities around them, are making billions of dollars off of life and death,” Murphy said at the beginning of the discussion. Gerratana, said prescription drug costs are part of the reason she ran for U.S. Congress in 2004. “A lot of what is happening now is the rollout of what happened way back then, and that was the establishment of our pharmaceutical benefit managers and the grip that ‘big pharma’ has at the federal level in Congress,” Gerratana said. Pharmaceutical benefit managers are essentially middlemen between drug manufacturers and healthcare beneficiaries. These managers develop, maintain and contract pharmacies and negotiate discounts with manufacturers. While touted as a money-saving operation, some PBMs have been criticized for being deceptive and fraudulent. Gerratana said Connecticut passed legislation last year that helps protect consumers. One part of the legislation removes language preventing lawsuits for pharmaceutical benefit managers, allowing them to be better held accountable. The second part of the legislation removed language allowing companies to place gag orders on pharmacists to prevent them from speaking to consumers about drug costs and potential alternatives. “So now you can talk with your pharmacist here in the state and say ‘Are there alternatives? Are there cheaper or less expensive alternatives that will be just as advantageous as the medications I’m on?’” Gerratana said. Gerratana said the Connecticut General Assembly introduced an act this year concerning prescription drug costs. The bill would also add elements of transparency to PBMs and how they operate. “I’m very excited to say finally that the state of Connecticut is stepping up and saying that we need to establish a framework – a regulation – that would lead to transparency in the pharmaceutical industry,” Gerratana said. Following an overview from the panel, the audience asked questions and gave comment about their healthcare experiences. Robert Newfield, a 30-year paramedic in the state, said rising prescription drug costs affect ambulance companies, too. Ambulance companies don’t pass on expenses for medications they administer, so rising costs makes it increasingly difficult for these companies to function, Newfield said. 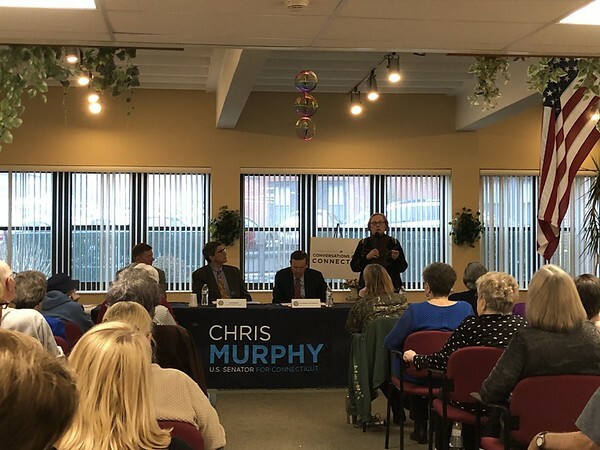 Murphy said he believes the country should be regulating prescription drug companies when it comes to pricing, but there are forces preventing that type of policy. Posted in New Britain Herald, General News on Monday, 16 April 2018 16:43. Updated: Monday, 16 April 2018 16:46.